Come home to a fabulous lake view and private pool! 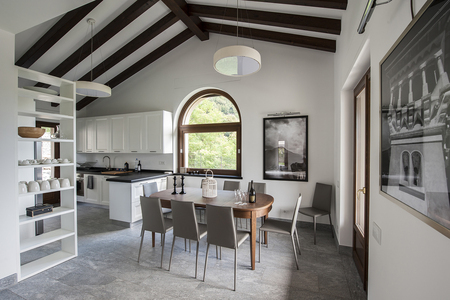 Tempting you with luxury refinement whilst away, this newly-built villa on the Tremezzo hills promises exclusive 21st century home comfort for 5 couples and groups of 10. 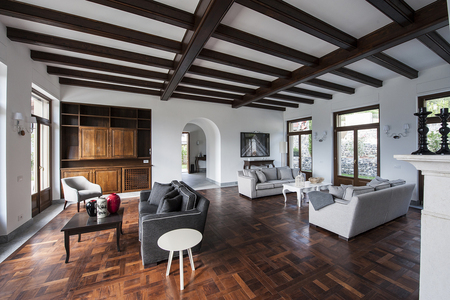 No expense has been spared in creating the ultimate finish to this 366mq three-storey villa. 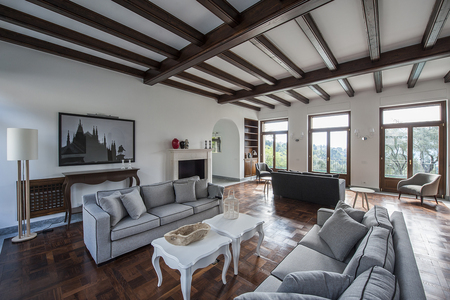 Fully-equipped with free WIFI, underfloor cooling and heating, the villa is made to be lived in and enjoyed. 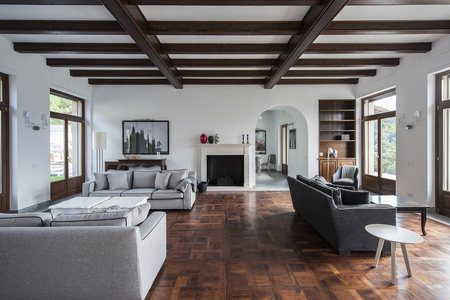 The generous open plan ground floor features classic dark parquet flooring, ambient beamed ceilings and arched entry ways and windows; to effortlessly combine the chic with the timeless. The spectacular principal Living room with triple French doors and cosy fireplace offers garden access and also leads through to a fabulous Kitchen with Dining area and access to a large covered alfresco dining terrace, perfect for entertaining. A sumptuous TV room to the lower ground floor also lets you kick back and indulge your passion for Hollywood movies. 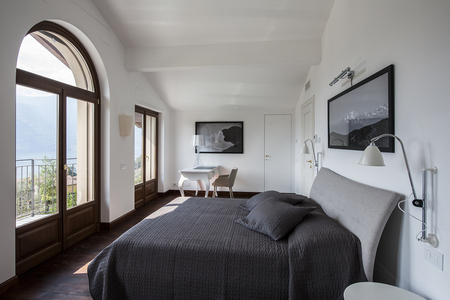 The upper floor features 5 boutique-style Double bedrooms, all with en-suite shower rooms. Balcony access also features to two of the Double bedrooms. 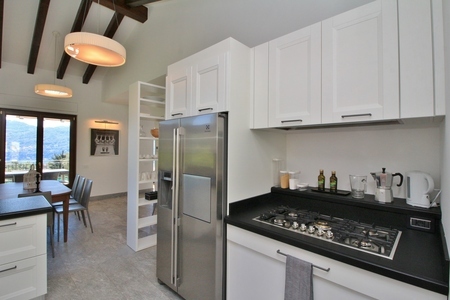 A ground floor cloakroom WC and an independent laundry room and pantry provides added convenience for families. The 1270mq private garden wraps around the detached villa and features a lovely sunny lawn with a portico terrace to the rear. The luxury outdoor swimming pool is accompanied by scenic sun terraces with 10 sun loungers to get out and enjoy. The covered alfresco dining terrace and gas BBQ also sets the scene for romantic alfresco dinner parties and relaxed lake view feasts. 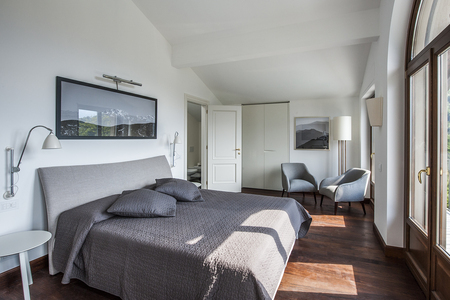 Nestled along the sunny Tremezzina hillside, the beautiful lake view setting leads in no time to the resort facilities of Tremezzo (2 minute drive/11-15 minute’s walk away). 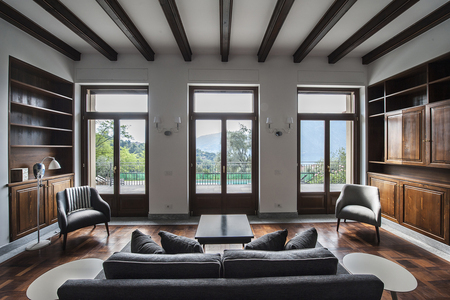 The luxury villa is also conveniently situated for reaching the nearby Villa attractions, the Tremezzina hiking trails and the convenient Central Lake ferry links (all within a 2-5 minutes’ drive). Famed for the glorious botanical gardens of Villa Carlotta and the iconic beauty of Villa Balbianello, the central western shore offers a fabulous visitor-friendly appeal; with a plethora of restaurants, cafes, bars and Lidos on hand to complement the picturesque historical lake villages, the prestigious Golf and Tennis Clubs in Menaggio and the wider highlights of Lake Como. Tremezzo provides easy access by road and public transport to the ‘Golden Triangle’ resort towns and the cities of Como, Lugano and Milan. Relaxing Living room • A gorgeous generous size Living room with dark parquet flooring and 10 ft beamed ceiling • One sumptuous sitting area is situated around the fireplace, the other overlooks the lake • Great space for entertaining; with direct access out to the private portico terrace lake view garden with pool • Features underfloor cooling and heating and dehumidification system. • Benefits from free WIFI access, a SAT TV, DVD player and i-TV is optional. 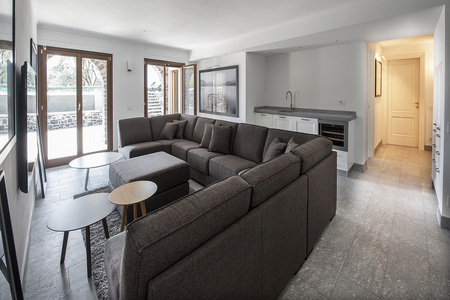 • The lower ground floor features a modern cinema room with sumptuous seating and a large wall mounted flat screen SAT TV with a DVD player and surround sound. Eating In Kitchen Diner • A luxury Kitchen equipped with a gas cooker hob, oven, microwave, toaster, electric kettle, coffee machine, dishwasher and American fridge freezer • Accompanied by a sleek dining area for 10 • Outside, the covered portico terrace offers alfresco dining opportunities too, with a large gas BBQ Sleeping The luxury villa provides the perfect retreat for 5 couples or mature family groups of 10. 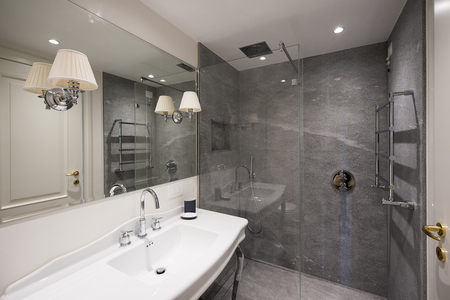 With underfloor cooling and heating and luxury en-suites bathrooms. Each boutique-style bedroom promises a restful and stylish retreat for all seasons. First floor Master Bedroom • A beautiful lake-view Double bedroom, with its own gorgeous lake view balcony • Complemented by a wardrobe and a contemporary fitted En-suite shower room Bedroom 2 • A luxury Double bedroom with spectacular mountain view balcony • Accompanied by a wardrobe and contemporary En-suite shower room Lower ground floor Bedroom 3 • A luxury Double bedroom • Features a wardrobe and a contemporary En-suite shower room Bedroom 4 • A luxury Double bedroom • Features a wardrobe and a contemporary En-suite shower room Bedroom 5 • A luxury Double bedroom with terrace access and wardrobe • Accompanied by an En-suite bathroom Extra For flexible family groups, single adult camp beds and infant cots can also be provided upon request (for an extra cost). 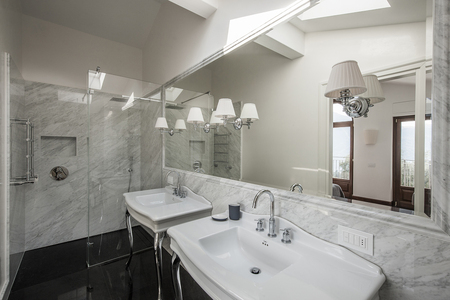 Bathing The luxury villa features 5.5 contemporary bathrooms. 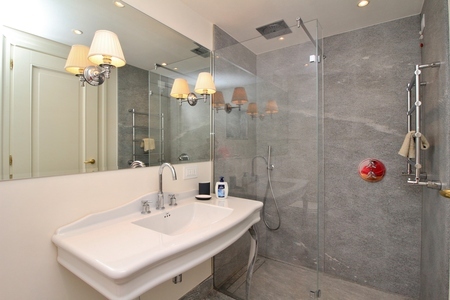 A cloakroom WC to the ground floor is complemented by 5 luxury en-suite bathrooms (each with a power shower, wash basin, WC) to each Double bedroom. Additional - Modern luxury villa with lake and mountain views - Underfloor cooling and heating and dehumidification - Free WIFI access, SAT TV, DVD player, music stereo and optional i-TV - Washing machine and ironing facilities - Pantry - Universal shaver plug and hairdryer - Private garden with pool - 10 Sun loungers - 32 internal steps - Private parking - A car is recommended due to the out-of-town hillside location Guests can also make the most of their luxury stay with a host of payable extras; from Daily Housekeeping, Private Chef, Private Tours and Babysitting services to Chartered yacht hire, Luxury boat trips, Airport transfers, Chauffeur service and more! Parking The villa benefits from a private parking space. 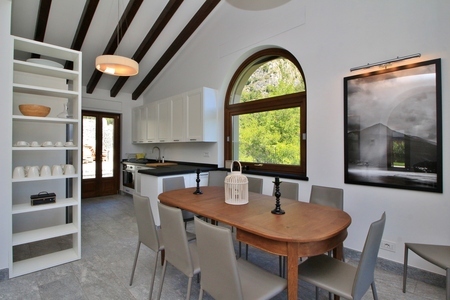 Location The luxury villa enjoys a very quiet and peaceful scenic setting, up on the hillside above central Tremezzo. Central Tremezzo (with its throng of lakeside restaurants, cafes, wine bars, passenger ferry links and Parco Teresio Olivelli with lake swimming area) is reachable in just 5 minutes’ by car. Top nearby attractions include Villa Carlotta, Villa Balbianello and the Lido di Lenno (all within a 5-10 minutes’ drive away). Nearby, Ossuccio offers opportunitues to hire a power boat and play some tennis, whilst the passing Greenway del Lago and nearby San Martino and Sacro Monte di Ossuccio climbs provide the perfect excuse for hikers to get out and about and explore. Other local highlights include Menaggio (with its Lido, famous Golf club and easy bus and road links to Lake Lugano) and Tremezzina’s enviable selection of restaurants and wine bars. The Cadenabbia car and passenger ferry stop (5 minutes’ drive away) offers the perfect way to soak up a day of sightseeing; with the picturesque resorts of Bellagio and Varenna just across the water. 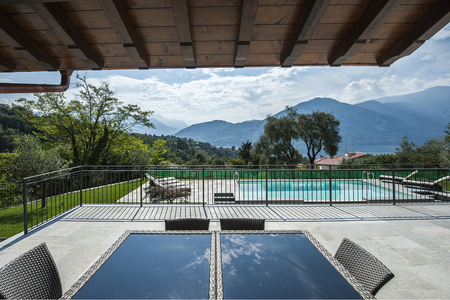 From Tremezzina, the nearby water sport and extreme sport pursuits can also easily be reached, alongside the Italian Alp ski resorts and the cities of Como, Lugano and Milan (all under 1.5 hours’ drive away). July 2017 Villa Fiordaliso was beautiful. 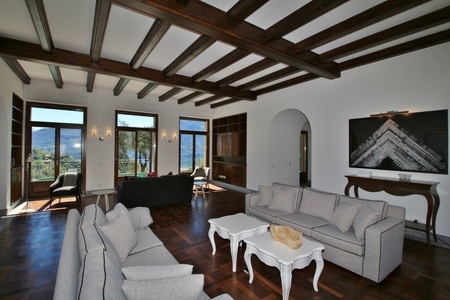 We had a wonderful stay at Lake Como and enjoyed the villa and pool very much. Thank you to the staff upon check in, Happy Holiday Homes staff drove up to the villa twice to show two parties in our group how to get there through the windy roads. The Villa was clean and very well cared for. 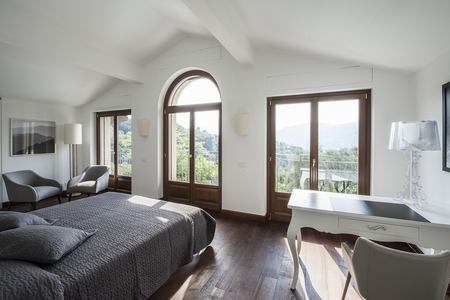 The beds were comfortable and the villa was spacious and well appointed. When we arrived tired and hungry Happy Holiday Homes had left a nice welcome basket with supplies to make a nice dinner and some snacks. It was very appreciated. When we threw a breaker and were without electricity on the entire first floor at 10:30 PM during our stay. The emergency number for Happy Holiday Homes responded immediately and had the electricity back on within 20 minutes!!! Excellent service. We are from the US and had no problem at all getting through and communicating our problem. We will definitely stay with Happy Holiday Homes in the future. Wendy, USA " Wendy Bronner "
July 2017 We would like to thank you for very nice vacations on Como in Villa Fiordaliso. We enjoyed everything. Your colleague concierge Madam Elisa was very helpful during our stay. Yulia, Russia " Yulia Serykh "
June 2017 We stayed at Villa Fiordaliso from June 17 to 24, 2017. The house was absolutely beautiful, and very comfortable, especially with the air conditioning. The view of Lake Como was spectacular. Since it was very hot, we made great use of the swimming pool. We visited Como and Bellagio by boat, and strolled through the gardens of Villa Carlotta. We ate at some nice restaurants, whose names I cannot remember; but we mostly ate our meals at the house, out on the beautiful patio. The staff was very friendly and pretty good at responding to our requests. 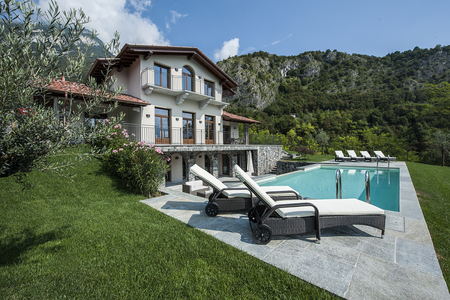 We had a wonderful time at Villa Fiordaliso and would recommend both the villa and your services to others. Debra, USA " Debra Camastro "